Welcome to the new SAP #S4HANA #Cloud use case series. We are happy to take the tradition of our use case series into the cloud and show you more about the advantages that come with the move to the cloud. We will start the series with an overview of the relevant value levers and then demonstrate their impact with several use cases. The digital enterprise will interconnect all aspects of the value chain to drive and anticipate business outcomes in real time. At this moment, we are witnessing an explosion of connections, data, and innovations. And even though this hyper connectivity has changed the game, customers are radically changing the rules – demanding simple, seamless, and personalized experiences at every touch point. In the same way, the impact of the changing workforce, the business networks, the challenges with Big Data, Internet of Things and Machine Learning are impacting every business – and with this, Digital Transformation is now imperative, and SAP S/4HANA as the digital core serves as the foundation for business innovations and optimizations. From changing processes to changing business models is the key in moving into the digital transformation. Today’s complexities prevents the successful transformation unfortunately. To solve this, we need to tackle that complexity, onboarding employees and processes, to leverage the digital transformation and gude them with digital assistants through the ever growing input sources to make the right decisions at the right moment. The classical enterprise core therefore needs to be redesigned. But how exactly does the digital core contribute? In the following blogs we will dive deeper into some selected use cases of SAP S/4HANA Cloud to explain the value levers helping us to understand how we can measure the positive impact of the digitized core on the organization. With the below value levers we develop a concept which can reflect the success, and on which all use cases and application are compared to. Generally spoken there are three dimensions, that drive every organization, and which every change and project should have positive impact on, in the best case on every of them. All 3 dimensions measure the impact of the digitized core on the organization and indicate how much the processes has developed, to the positive or negative. Keep in mind: many accelerations are not just nice to have, they are a direct consequence of a digitally transformed world. An efficient process from the past might be very inefficient going forward. And technology is enabling us to do thinks different than in the past. Let us explain the precise value levers behind these three dimension and clarify how and what they actually leverage in your business. With increase efficiency, we mean that the customer need to do things right and how the customers are good with their processes. This value lever emphasizes the new unseen speed of a digitized core, which undermines every process made. In the past even for simple requests or analysis, long time consuming batch processes or transactions were required. This sometimes can take 30 seconds for the easier ones but complex reports may take days. With the digitized core typical in-memory technology you can break that length down to either a few seconds or just minutes respectively. 30 seconds doesn’t sound too long you might think…. But we know from research that if something needs more than 30 seconds to load or transact, user’s attention moves on to different tasks. This ultimately means that people have several unfinished workflows opened and can’t focus on one to finalize it and move on. But what if you don’t have to wait at all, because the task has already been done automatically. This is what the value lever “automate process steps” allows. Routine task, which don’t need careful manual consideration can be automated with the help of the digitized core. Based on patterns, defined criteria and algorithm, the system can decide if a request needs a manual interaction or not. This significantly increases the availability of important zero touch processes. The technical merger of the transactional and analytical layer allows to check patterns in real time. If orders do not match specific quality criteria’s, they are handed over into the exception list. But we don´t analyze any more after the fact. This is a very powerful change. The real benefit here is that automated decisions free up the schedule and give employees time back for important and value add tasks and allow to focus on exceptions. We have taken this to the next level by introducing a digital assistant that leverages machine learning concepts, but more on this later. Here again,I want to emphasize that the data is captured only at the source which then allows to deal with a single truth. With a digital economy, digital out-tasking becomes a significant higher importance. Compared to out-sourcing, out-tasking means that you still manage the basic part of the whole process, but steps in between can be outsourced to external services. This allows you to focus on your key expertise and leave the rest to experts on that field. This will increase the efficiency of your processes and reduce costs in several ways. By leaving processes like data completion services or credibility checks or specific data mining to expert services, you will reach a much higher quality at better costs. In the following two blogs we will take a look at the other two dimensions and the value levers that define them. 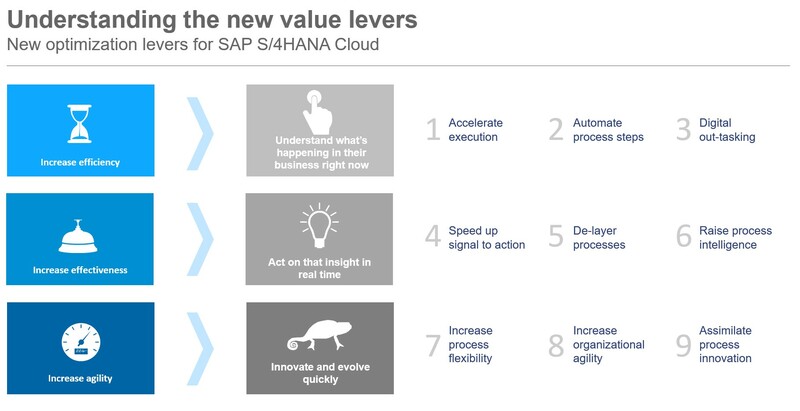 To explain this dimensions and value levers a little deeper, we developed several use cases to show you the innovations done with SAP S/4HANA Cloud to cover the new challenges driven by the digital transformation. In each use case we will explain how the three dimensions on the value levers are impacted.